Did you know that the Russians have a massive underground complex in the Ural mountains that has been estimated to be approximately 400 square miles in size? In other words, it is roughly as big as the area inside the Washington D.C. beltway. Back in the 1990s, the Clinton administration was deeply concerned about the construction of this enormous complex deep inside Yamantau mountain, but they could never seem to get any straight answers from the Russians. The command center for this complex is rumored to be 3,000 feet directly straight down from the summit of this giant rock quartz mountain. And of course U.S. military officials will admit that there are dozens of other similar sites throughout Russia, although most of them are thought to be quite a bit smaller. But that is not all that the Russians have been up to. For example, Russian television has reported that 5,000 new emergency nuclear bomb shelters were scheduled to have been completed in the city of Moscow alone by the end of 2012. Most Americans don’t realize this, but the Russians have never stopped making preparations for nuclear war. Meanwhile, the U.S. government has essentially done nothing to prepare our citizens for an attack. The assumption seems to be that a nuclear attack will probably never happen, and that if it does it will probably mean the end of our civilization anyway. Large excavation projects have been observed by U.S. satellite imagery as recently as the late 1990s, during the time of Boris Yeltsin’s government after the fall of the Soviet Union. Two garrisons, Beloretsk-15 and Beloretsk-16, were built on top of the facility, and possibly a third, Alkino-2, as well, and became the closed town of Mezhgorye in 1995. They are said to house 30,000 workers each. Repeated U.S. questions have yielded several different responses from the Russian government regarding Mount Yamantaw. They have said it is a mining site, a repository for Russian treasures, a food storage area, and a bunker for leaders in case of nuclear war. Responding to questions regarding Yamantaw in 1996, Russia’s Defense Ministry stated: “The practice does not exist in the Defense Ministry of Russia of informing foreign mass media about facilities, whatever they are, that are under construction in the interests of strengthening the security of Russia.” Large rail lines serve the facility. In a secret project reminiscent of the chilliest days of the cold war, Russia is building a mammoth underground military complex in the Ural Mountains, Western officials and Russian witnesses say. Hidden inside Yamantau mountain in the Beloretsk area of the southern Urals, the project involves the construction of a huge complex served by a railroad, a highway and thousands of workers. A report in Sovetskaya Rossiya said the project involves construction of a railroad, a modern highway and towns for tens of thousands of workers and their families. “The complex is as big as the Washington area inside the Beltway,” said an American official familiar with intelligence reports. It is believed to be large enough to house 60,000 persons, with a special air filtration system designed to withstand a nuclear, chemical or biological attack. Enough food and water is believed to be stored at the site to sustain the entire underground population for months on end. Die-hard [U.S.] nuclear war planners actually have their eyes on targets in Russia and China, including missile silos and leadership bunkers. For these planners, the Cold War never ended. Their top two candidates [i.e., targets] in Russia are located inside the Yamantau and Kosvinsky mountains in the central and southern Urals. Both were huge construction projects begun in the late 1970s, when U.S. nuclear firepower took special aim at the Communist Party’s leadership complex. Fearing a decapitating strike, the Soviets sent tens of thousands of workers to these remote sites, where U.S. spy satellites spotted them still toiling away in the late 1990s. But the Russians have not just been building giant underground facilities deep in the Urals. They have also been constructing thousands of new underground bomb shelters in major cities such as Moscow. Nearly 5,000 new emergency bomb shelters will be built in Moscow by 2012 to save people in case of potential attacks. Moscow authorities say the measure is urgent as the shelters currently available in the city can house no more that half of its population. In the last 20 years, the area of air-raid defense has been developed little, and the existing shelters have become outdated. Moreover, they are located mostly in the city center, which makes densely populated Moscow outskirts especially vulnerable in the event of a nuclear attack. In order to resolve the issue, the city has given architects a task to construct a typical model of an easy-to-build shelter that will be located all over the city 10 to 15 meters underneath apartment blocks, shopping centers, sport complexes and parks, as in case of attack people will need to reach the shelters within a minute. Of course all of this construction cost the Russians a lot of money. Though the bunkers are supposed to be designed to shelter the population in the event of a nuclear attack, government officials say it’s only a precaution and they do not expect such an attack or nuclear outbreak (e.g. Chernobyl) to occur. Neither RT or the Russian government provided estimates for the cost of the facilities. A Popular Mechanics article that reviewed a number of different types of bunkers and building practices had varying prices depending on the type of shelter. Since the proposed Russian bunkers would hold roughly 1000 people each (based on the population count and other details), one could estimate that the lowest price point for a bunker this size, with basic necessities like bathrooms and reserve food for a day or two, may run in the area of around $100,000 – $200,000. This would put a conservative price tag for 5000 shelters anywhere from half a billion to a billion dollars. A significant investment, indeed. Has the U.S. government constructed any bunkers for the survival of the general population in the United States? Of course not. In the event of a nuclear war, I guess they just expect pretty much all of us to die. Russia is launching a new national defense facility, which is meant to monitor threats to national security in peacetime, but would take control of the entire country in case of war. 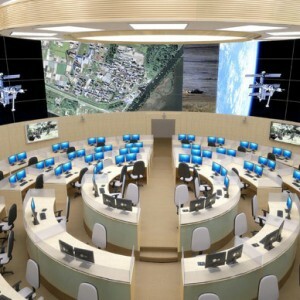 The new top-security, fortified facility in Moscow includes several large war rooms, a brand new supercomputer in the heart of a state-of-the-art data processing center, underground facilities, secret transport routes for emergency evacuation and a helicopter pad, which was deployed for the first time on Nov. 24 on the Moscow River. The Defense Ministry won’t disclose the price tag for the site, but it is estimated at the equivalent of several billion dollars. In addition, the Russians have also been developing a new anti-ballistic missile system that is designed to keep U.S. nuclear missiles from getting to their targets in the first place. The S-500 is not an upgrade of the S-400, but a new design. It uses a lot of new technology and is superior to the S-400. It was designed to intercept ballistic missiles. It is planned to have a range of 500-600 km and hit targets at altitudes as high as 40 km. Some sources claim that this system is capable of tracking 5-20 ballistic targets and intercepting up to 5-10 ballistic targets simultaneously. It can defeat ballistic missiles traveling at 5-7 kilometers per second. It has been reported that this air defense system can also target low orbital satellites. It is planned that the S-500 will shield Moscow and the regions around it. It will replace the current A-135 anti-ballistic missile system. The S-500 missiles will be used only against the most important targets, such as intercontinental ballistic missiles, AWACS and jamming aircraft. Sadly, most Americans are not interested in this stuff at all. These days, most Americans just assume that the Russians are “our friends” and that a war with Russia could never possibly happen. What they don’t realize is that the Russian people see things very, very differently. Today, 81 percent of Russians have a negative opinion of the United States. Our interference in the conflict in Ukraine has made the Russian people very angry, and there are many over there that now believe that a shooting war with the United States is inevitable. Yesterday, in a vote that largely slid under the radar, the House of Representatives passed a resolution urging Obama to send lethal aid to Ukraine, providing offensive, not just “defensive” weapons to the Ukraine army – the same insolvent, hyperinflating Ukraine which, with a Caa3/CC credit rating, last week started preparations to issue sovereign debt with a US guarantee, in essence making it a part of the United States (something the US previously did as a favor to Egypt before the Muslim Brotherhood puppet regime was swept from power by the local army). The resolution passed with broad bipartisan support by a count of 348 to 48. If Obama does decide to send lethal military aid to the Ukrainians, the Russians are going to flip out. Sadly, neither side seems very interested in peace at this point. We just continue to take even more steps along the road toward World War III, and it is a war that the United States is completely and utterly unprepared for. Who Will Say No to Trump Now?